In 1966 May Ammon, the Principal of the Ackland-Burghley School approached Doug Daniels to start an astronomy adult evening class at the school. After a year, due to the pressure of work, Doug handed the class over to Terry Pearce, a long-term friend and a keen amateur telescope maker. During the subsequent years, by popular demand of the students, the class evolved into not just an astronomy class, but a telescope making class, where members were encouraged to grind, polish and figure their own telescope mirrors and build their own instruments from scratch. By introducing many people to the study of astronomy and telescope making, the class also became a natural source for demonstrators and assistants at the Hampstead Observatory, and many of the alumni became members of the Hampstead Scientific Society. The class continued to meet weekly throughout the intervening years, surviving the closure of the original Ackland-Burghley venue and finally moving to the Westminster Kingsway College. It was at this institution that it was finally closed down two years ago due to �economic cutbacks�, by a disinterested adult education authority. The remaining members of the class were not happy with this decision and so the Camden Amateur Telescope Society (C.A.T.S.) was formed to carry on the good work and application was made to affiliate it to the Astronomy Section of the H.S.S. C.A.T.S. 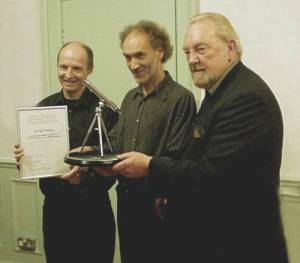 now meets fortnightly at the Highgate Newtown Community Centre and it was at that location that past and present members gathered on the evening of October the 11th to honour their mentor Terry Pearce, for 38 years continuous service to the study of astronomy and telescope making. Many members brought along their telescopes and enjoyed the opportunity to renew old acquaintances and meet new fellow enthusiasts. At the ceremony, Terry was elected Honorary Life President of C.A.T.S. and was presented with a certificate and a trophy, in the form of a model telescope, designed and made by Simon Lang, to whom we are also grateful for organizing the splendid party that followed. Anyone interested in joining the class should contact Simon Lang.